INDUSTRY.co.id - Jakarta - Share price of PT Surya Pertiwi Tbk (SPTO) rose by 10.34% or Rp120 to Rp1,280 per unit in the first trading on the Indonesia Stock Exchange (BEI) on Monday (14/05/18), compared to the price set in the Bid General Prime Share (PUPS) some time ago amounted to Rp1.160 per unit. 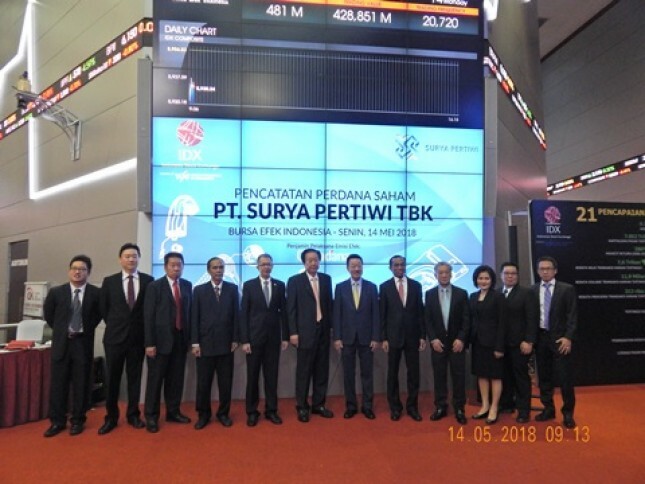 With the commencement of SPTO trading today, the company becomes the 12th company this year listing its shares on BEI as well as becoming the 577th issuer in Indonesia capital market. In the PUPS, the company offered shares to release as much as 26% or equivalent to 700 million new shares valued at Rp1,160 per share. The number of such shares includes shares offered to employees through the employee stock alocation (ESA) program. Thus, the company through the PUPS has obtained additional capital of Rp812 billion. The amount of additional capital has not been reduced by the cost of the company's shares. "Funds obtained from the PUPS will be used to improve the capital structure through debt repayment, capital expenditures, by increasing the production capacity of SPN plants in Surabaya by two production lines up to 2020 and working capital," said Tjahjono Alim, President Director of SPTO Main Hall Indonesia Stock Exchange, Jakarta, Monday (14/05/2018). The company's subsidiary in Surabaya, PT Surya Pertiwi Nusantara, has been operating commercially since 26 April 2018. SPN manufactures TOTO brand sanitary items and serves customers in Surabaya and eastern Indonesia. At present the SPN factory has a production capacity of approximately 500,000 units per year and is built on 35 hectares of land that can accommodate up to 10 production lines, and will support economic growth around it. Tjahjono continued, public investors gave very positive to SPTO offer through PUPS which was held on 4-8 May 2018. Therefore, SPTO's offer in PUPS is oversubscribed up to 38 times. In the PUPS, the SPTO management has appointed PT Ciptadana Sekuritas Asia as the underwriter of the securities emissions. Currently, the company has a market share of over 55% in the sanitary industry sector and has a distribution network in 14 major cities in Indonesia, in addition to Jakarta and Surabaya covering all of Indonesia's pulp.